Spring in Texas means birthday parties. I suppose all the wise mothers in town (like myself) planned accordingly so as not to be pregnant during the oppressive summer heat, thus causing for an overwhelming number of births right before the temperature begins to rise. A few weeks back I scored a stack of lovely brand new paperbacks from a local bookshop, including two copies of Goodnight Moon, thinking I'd be set for a few birthday parties, only later to realize later that I don't know anyone with babies anymore. Lucky for me, my super sweet neighbor got pregnant.. so one down. Alas, the other copy still goes homeless, until one lucky reader wins it next week. To be entered to win this brand spanking new paperback copy of the classic Goodnight Moon, all you have to do is comment on this post before Sunday night (April 11) at 11:59 PM. A winner will be selected at random the next day. As for last week's not-so-mystery give... an excellent ex-library copy of This Is Texas... that little prize goes to Amy R. W. Congrats and send me your shipping info to webe(at)soon(dot)com. Have a great morning people! Have wanted my own copy of this classic for a while now! We'd love a nice copy of this one! Our board book version is seriously tattered, now that we're working our fourth little one through it! One of my hubby's faves to read. Definitely a great book, and one I don't currently have! My child just loves this book and enjoys pointing at all the objects in the illustrations. We would love a copy of this one! Thanks so much for all you do. I check it out from the library whenever I have babies, but somehow have never bought my own copy. I would LOVE to add this one to our needing-updating collection!!! My kids have been "Goodnight Moon"-less and have never heard it. I would love to read it to them at last! Thanks for this great giveaway! The kids love this book. Thanks for the chance. This is a classic that I would love to share with my grandson. I also have two close friends who are having their first babies within the next two months. I will probably keep it at my home (if I am the lucky winner) so that I can read to all three and hopefully a future grandchild. 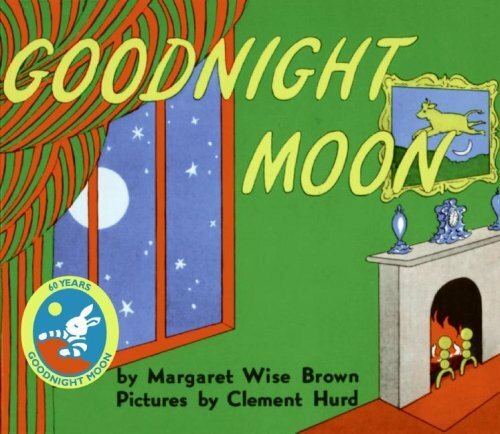 I would love to win this copy of "Goodnight Moon" for my preschool classrom shelf! I would love a copy of this wonderful book. I would love a copy of this book for my kids! It was one of my favorites as a kids! I've always wanted a copy of this one! Please enter me! My copy is locked away in the back of the shed. I would love to relive this great book. I've always wanted a copy of this book! This was a family favorite when I was growing up and I'd love to share it with my kids!